Unfolds the fascinating history behind the founding of America, and exposes the esoteric underbelly of its design. Why is Washington D.C. build on the 77th Meridian? Are the Revolutionary War cities really built in perfect alignment with Stonehenge? If America was founded as a Christian nation, why are many of its symbols based on Pagan traditions? “Is the New Age really new? 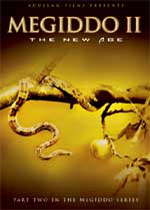 Or does it represent the ancient doctrine taught by the serpent to Eve in the Garden of Eden? The answer will startle and amaze you as you learn the influence of the serpent's teaching through the spiritual explosion of occult activity in the 19th and 20th centuries. Adullam Films is pleased to present our new website! Our webmaster has worked many hours, but thank the Lord, the new website is up and running. For a long time, we have desired to share with others some of the materials gathered through our work in film and video. These materials include our newly developed DOCU-CLIPS page, which features never-before-seen interview clips (well, mostly) from the outstanding speakers we’ve had the pleasure of meeting over the past few years. Included are Dave Hunt, Dr. Kent Hovind, Pastor Joe Schimmel, Caryl Matrisciana, William T. Still, and Dr. I.D.E. Thomas – for starters. We're planning to add more docu-clips in the future as time allows. But even now there is over 2 hours of viewing material currently available on this page. Also, check out our newly posted ARTICLES which include some of the important research done since Adullam Films began, while our RADIO page features some of the interviews given by Chris Pinto in 2006 since the release of Secret Mysteries. Listen for some insightful interviews with radio hosts that include Dr. Stan Monteith of Radio Liberty and Dr. Larry Spargimino from Southwest Radio Church. We are thankful to all our radio hosts for providing the necessary audio files for this page. The following article deals with much of the research uncovered for the Secret Mysteries series. Those who have seen the documentary should appreciate the information as it includes certain details not contained in the film. hope that is meant to be fulfilled." 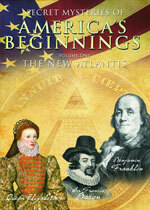 The Bush quote is shown in our latest documentary, Secret Mysteries of America's Beginnings, Volume I: The New Atlantis. 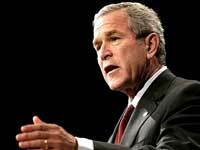 The question that we ask in this film is, What is the ancient hope that President Bush is referring to? According to occult philosphers, this ancient hope could be best described as the restoration of the lost empire of Atlantis. In order to understand the importance of Atlantis in the New Age and New World Order movements, you must understand that those of the esoteric community consider this ancient empire to be the source of all occult knowledge and wisdom. Atlantis is said to be the origin of the Ancient Mystery religion, which is the philosophy of all the secret societies, including Freemasons, Rosicrucians, Skull & Bones, etc. 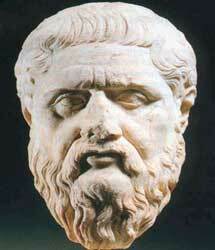 The earliest recorded account of Atlantis comes from the Greek philosopher, Plato in a dialogue called The Critias. In this account, the tale of Atlantis is said to have been handed down by the ancient Greek lawgiver, Solon. bearers, Solon was rowed out over the dark waters. Notice how in the above quote, Atlantis was thought to be a global empire "which extended to every corner of the world." Hall goes on to tell us that this society had been governed by laws that were written on these Atlantean columns. These columns are written about in other occult writings, and seem to represent the core of the Ancient Mysteries (more on this later). 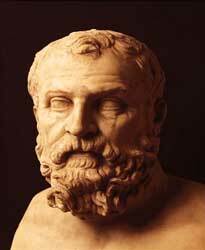 After witnessing these, Solon supposedly returned to Greece to impart the wisdom he had gained to his fellow Athenians. From there, Solon is said to have handed this story down to a fellow named Dropis, who told it to an elder Critias, who told it to the Critias of Plato's dialogue. Because of this, Plato says that the Atlantean account is based on the "authority of Solon." In the pictures below, notice the placement of Solon on our government buildings. The first image on the left is the reverse of the Supreme Court building. In the center is Moses, holding the stone tablets containing the Ten Commandments. To his right is Confucius, the Chinese philosopher. 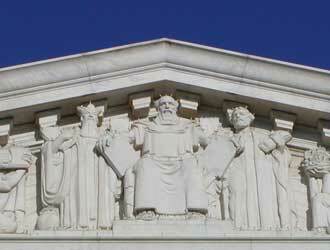 While on his left is the Greek lawgiver, Solon. 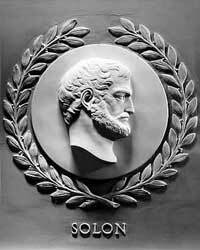 bust of Solon in the House of Representatives. Clearly, this ancient Athenian philosopher was deemed important to the designers of Washington D.C. Was it because of Solon's knowledge of law? Or because Plato cites him for the tale of lost Atlantis? The columns Solon was shown are said to have been carved by Enoch. According to occult lore, the Mysteries are traced all the way back to Enoch who is called the first "Initiator" and king of Atlantis. the columns ... erected by him, is probably symbolical. supposed to symbolize the mysteries ..."
Obviously, the Enoch of the occult is not really the Enoch of the Bible. Like Moses, the occultists have hijacked a Biblical character to lend credibility to their own ideas. As Pike reveals, Enoch would become known as Hermes, or Hermes Trismegistus. Also from Enoch (i.e. Hermes) we are told comes the Hermetic Maxim: as above, so below. The full statement is "What is above is like what is below; and what is below is like what is above." 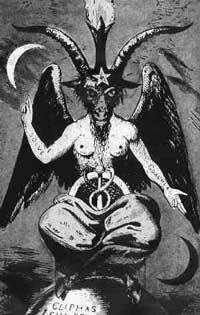 This principle is visually represented by the Tarot card (below left) and the drawing of the Baphomet (below right). Notice the position of the hands, one pointing "above," while the other points "below." The picture at right is of the statue of George Washington as it appears in the Smithsonian Museum. Compare the position of Washington's hands here with those of the images above. Here we can see the recurring theme of Hermetic philosophy ("as above, so below") throughout all levels of the occult. 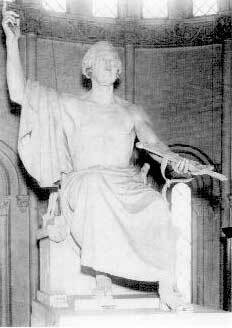 Please remember that this statue (along with most of the other statues and paintings of him) was created long after George Washington's death. It is a matter of debate as to whether or not Washington would have approved of the "esoteric" representation of him often shown in such images. 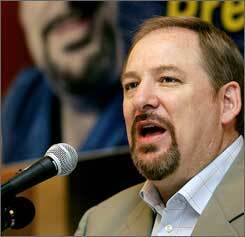 "Five of the six scriptures that Rick Warren cites in his first chapter all come from The Message. 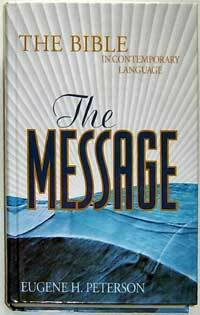 Even the title of the first chapter, 'It All Starts with God,' is taken from The Message paraphrase of Colossians 1:16, which appears right under the chapter heading. he, ye shall die in your sins." immanent God within ourselves are one." 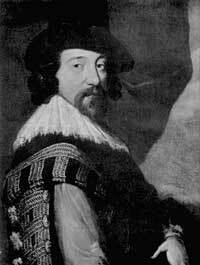 In the 17th century, Sir Francis Bacon recorded his final work titled, The New Atlantis. Like the Atlantis of Plato, it is told as a story without an ending. Both Plato and Bacon take their stories to a climactic point, and then suddenly drop them off without a finish. Having interviewed a number of esoteric teachers, I have come to suspect that this was intentional. The unfinished "Atlantis" is likely a picture of the unfinished pyramid on the back of the dollar bill. For those who have not yet realized it, The New Atlantis, The New World Order, and The New Order of the Ages are all one and the same. As such, the "new" Atlantis represents what secret societies refer to as "The Great Work" that is yet to be completed. Bringing this work to its finish is said to be the true purpose of secret orders. Bacon writes about how there was a time when the American continent flourished with "tall ships" and was frequented by ancient peoples. Admittedly, his tale is told as an allegory. Nevertheless, this idea of America as Atlantis is believed by certain members of the New Age community today. Benjamin Creme, the self-described messenger of the Maitreya (new age Christ) spoke to an NGO group at the United Nations in July of this year. Afterward, he flew to Los Angeles where he gave an interview in which he revealed that he believes America is the site of ancient Atlantis. This opinion is likewise held by Dr. Robert Hieronimus, author of the book America's Secret Destiny. Dr. Hieronimus (whose research has been used by the White House) is considered the leading expert on the Great Seal of the United States. He gave an interview in June of this year where he said, "the east coast of America was the west coast of Atlantis." The knowledge of America prior to the time of Columbus was explored by Harvard Professor, Barry Fell. Fell's research is recorded in the book, America B.C., where he demonstrates the presence of ancient European cultures in America long before the new world was discovered (as far back as 800 B.C.). 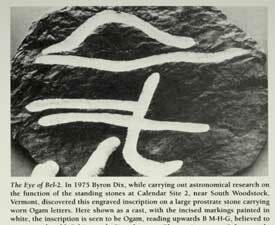 The picture to the right shows a carving labeled the Eye of Bel (or Baal), found near South Woodstock, Vermont. Another site discovered by Fell is Mystery Hill, New Hampshire, today called "America's Stonehenge." The Old New Hampshire Online Magazine reports that "inscribed tablets" of Bel/Baal have been discovered there that date centuries prior to the time of Columbus. "It must be remembered that Bacon did not play a lone hand; he was the head of a secret society including in its membership the most brilliant intellectuals of his day. All these men were bound together by a common oath to labor in the cause of a world democracy. Bacon's society of the unknown philosophers included men of high rank and broad influence. Together with Bacon, they devised the colonization scheme." 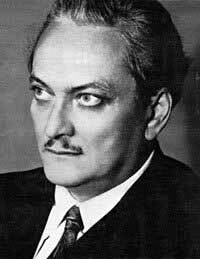 Take careful note of the final words from Manly Hall's quote, as he mentions the colonization scheme. Why would he choose such words? This 1910 Newfoundland stamp seems to provide a clue. 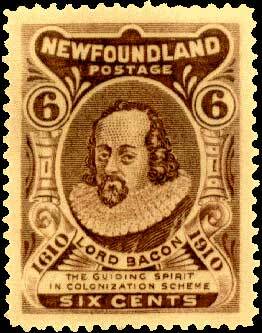 It shows the image of Bacon, with the words beneath: Lord Bacon, the Guiding Spirit in Colonization Scheme. From this, it would seem there was a time when knowledge of Bacon's plan was more widespread than it is today. More than a few researchers have taken note of the three sixes found on the stamp. Just a coincidence? In his lifetime, Bacon referred to himself as "The Herald of the New Age." The full title of Bacon's book is, "The New Atlantis: Land of the Rosicrucia." 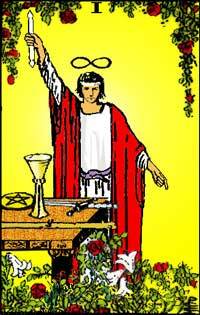 The Rosicrucians are symbolized by the rose and the cross. The rose symbolizes the Ancient Mysteries, while the cross symbolizes Christianity. The combining of these two is at the core of Rosicrucian belief. But one of the chief practices of Rosicrucianism is communicating with the spirit realm; literally, channeling spirits for the purpose of obtaining secret knowledge. During the Middle Ages, this practice would have been openly condemned by both the Catholic and Protestant churches of the time. Fearing prison or death, the Rosicrucians could have outwardly professed Christianity, while secretly maintaining their inner program based in occult doctrine. In later articles, we intend to explore more fully the influence of the Rosicrucian doctrine upon the founding and development of America. We beg your patience as you navigate our newly designed website, and encourage you to send us your comments. If you do not yet know the Lord Jesus Christ, and would like to learn about salvation through faith in Him, we invite you to visit our SALVATION page for more information. P.S. Adullam Films has recently added the domain name filmforjesus.com to make our web address easier to remember. God bless.